Because of persecution, he had to delay his priestly ordination for nearly 30 years. Subjected to seven years of forced labor. He contributed to the rebirth of the diocese. He was an official bishop, recognized by the Holy See and the Chinese government. Hong Kong (AsiaNews) - Bishop Mathew Hu Xiande of Ningbo (Zhejiang), died today at 2.35 am (local time). He was forced to delay his priestly ordination for decades and spent seven years in forced labor camps because of his fidelity to the faith. 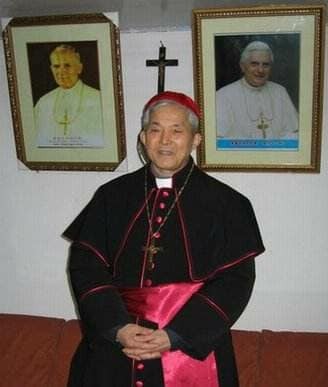 The Ningbo diocese has indicated that bishop's funeral will take place on September 28; the bishop's body may be honored by the faithful from 25 to 28 in the Jiangbei Church. The bishop is highly respected and loved by the faithful because he contributed with great energy to rebuilding community life, which almost became extinct during the persecution of the Cultural Revolution. Msgr. Hu was born on 27 August 1934. Between 1950 and 1958 he studied at the seminaries in Ningbo and Shanghai. With the tightening of the campaign for an independent Church from the Vatican, from 1958 to 1965 he was subjected to forced labor (reform through labor). In 1978, after being rehabilitated, he continued to work as a farmer until 1984 when he was able to study at the Shanghai Seminary in Sheshan. He was ordained in 1985 by then bishop Jin Luxian and worked as a pastor in the diocese. In December 1987 he began pastoral work at Cixi, about 60km northwest of Ningbo, where there is a lively Catholic community. Ordained bishop coadjutor of Ningbo on May 14, 2000 by Msgr. Giuseppe Ma Xuesheng, he succeeded in leading the diocese until his death in 2004. Msgr Hu, recognized by the government, was a bishop approved by the Holy See. The life of the Ningbo Church was virtually wiped out during the Cultural Revolution. At present there are 30,000 faithful served by 31 priests and 31 sisters. There are also 14 seminarians.